"The retrospective monograph The Photographs of Frederick H. Evans, curated by Anne Lyden and complemented by Hope Kingsley's essay, provides a wonderful tribute to this renowned English photographer. 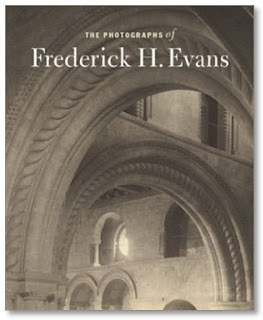 Evans was an active photographer from the early 1880's well into the 1930's. Although his subjects ranged from portraits to the rural landscape and English country homes, he is best known for his poetic photographs of English and French Cathedrals." --- --- from Douglas Stockdale's review of The Photographs of Frederick H. Evans by Anne M. Lyden in photo-eye Magazine.